This is technically Brady's third Christmas. His first Christmas, he was almost 2 months old and to be honest, I can't remember a single thing from it! Last year, he was almost 14 months and he didn't quite get it. He was more excited about the balls on the tree than anything! 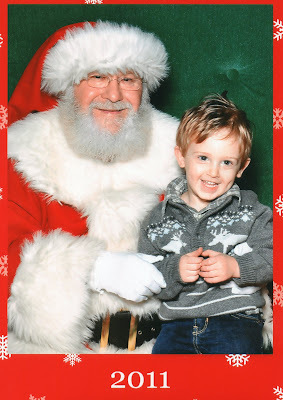 This year, he will be 26 months and boy, does he get it! This year, he says that Santa is bringing him a 'BIG truck!' Sometimes, he'll joke and say that Santa is bringing him poop or a dirty diaper and then says, Noooooo! This year, he sat down and played with baby 'Jeese'(Jesus) and his mommy and daddy. This year, he brought back the magic. I've always loved Christmas but it's not quite the same as it was when I was a child. That is, until I had a child of my own. This year, I have a giddy feeling inside. This year, I'll be full of that sleepy excitement as I try to sleep on Christmas Eve. The holidays are hard. We have too many people to miss but the magic helps. The magic is back and it does nothing but make me smile. First, I just have to get through this week. I have a gazillion things to do. Somehow the only one that is pregnant and has a two year old is hosting Christmas this year for two sides of the family. My dad's side of the family will be over for brunch and my IL's for dinner. I am hoping the magic keeps me sane through it all. At least I don't have to cook dinner, it will be brought to us! Whew, right? Amy, I seriously can't believe how BIG he is! I just want to squeeze those cheeks! PS- Lizzy is obsessed with the trash man too. Only? She always yells "DADDY!" whenever she sees a garbage truck, and Justin is definitely not a garbage man, lol. Ahhh! Totally cute Santa picture. Love this post! Kelan gets it this year too and it does make the holidays much more fun and magical! Hope you have a great Christmas!